The pope has arrived. That’s right: Pope Francis has touched down on American soil today for the very first time. The head of the Catholic Church kicked-off his current overseas trip in Cuba on Saturday, and departed today for his maiden voyage to America, which begins in its capital city. From Washington, D.C., Pope Francis will continue his expected six-day stint in the U.S. in New York City and Philadelphia before heading home to Vatican City. From the uber-high security detail to the enormous traveling entourage and everything in between, here’s how the globetrotting pontiff will get from point A to point B during his stay in America. History of Popes in the U.S. When the Pope travels, he brings what amounts to a mini-Vatican along with him. According to Crux, the pope’s traveling church entourage includes about 30 people, such as the Vatican clergy and employees of the Vatican press office. Pope Francis doesn't speak English as strongly as he does other languages, so his official translator for his trip to America, Monsignor Mark Miles, will remain close to the pope during his visit. Msgr. Miles was the man by Pope Francis’ side when President Obama visited him at the Vatican March 27, 2014. 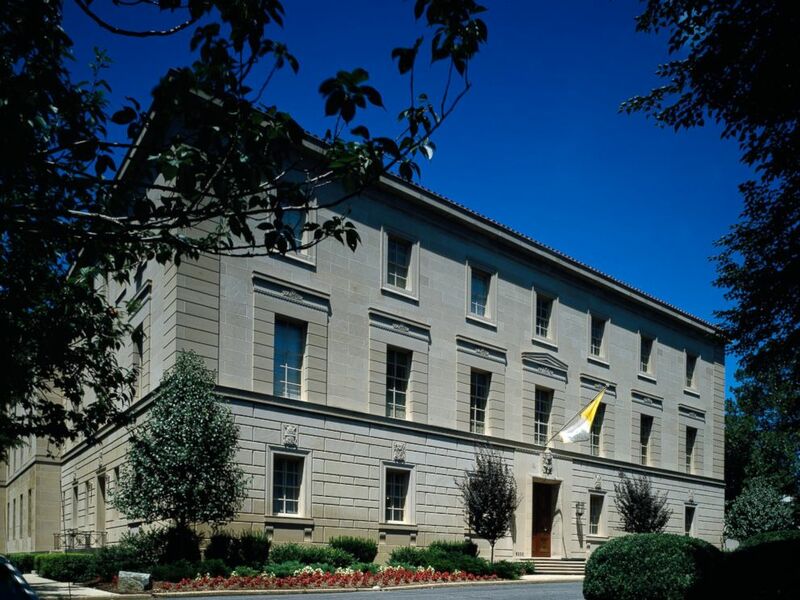 The Apostolic Nunciature of the Holy See, or Vatican Embassy in Washington. Also accompanying the pope during his tour of America is a massive security detail. Vatican Security and the U.S. Secret Service have teamed up to provide protection during his stay. Where the Pope Is Staying in D.C. While in Washington, Pope Francis will stay at the Apostolic Nunciature of the Holy See to the United States, colloquially known as the “Vatican Embassy.” Located on the portion of Massachusetts Avenue known as “Embassy Row,” the Vatican Embassy boasts a chapel, beautiful stained-glass windows and a small outdoor garden. Pope Francis meets the journalists aboard the papal airplane on the occasion of his visit to Quito, Ecuador, July 5, 2015. He may be arguably the most famous person in the world, but Pope Francis isn’t above carrying his own luggage. 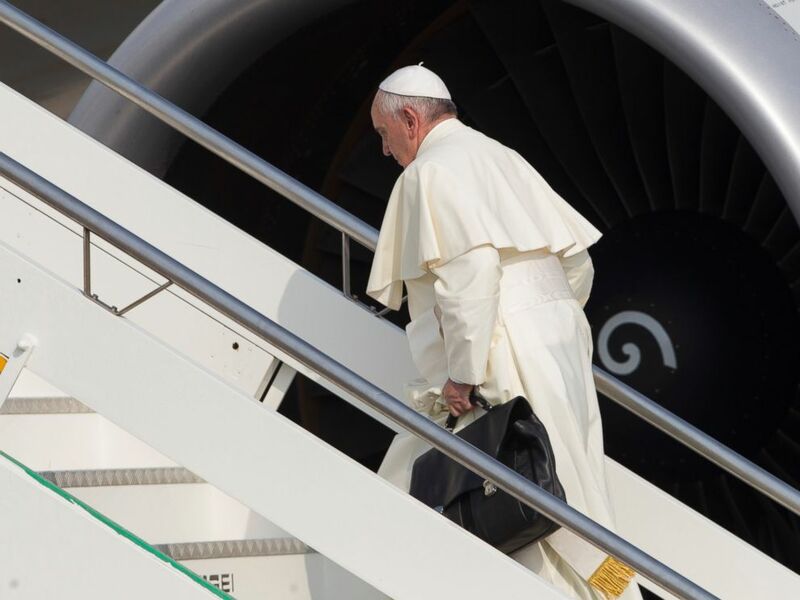 The pope was first seen carrying his own baggage in 2013 while boarding the papal plane for a trip to Brazil. During the press conference on the papal return flight, Pope Francis revealed what he carries in his traveling black leather satchel: A razor, a breviary, an appointment book and a book to read. “I was carrying it because that’s what I’ve always done. When I travel, I carry it,” the pope said. Sure enough, Pope Francis was seen toting the black bag upon his departure for Cuba on Saturday. 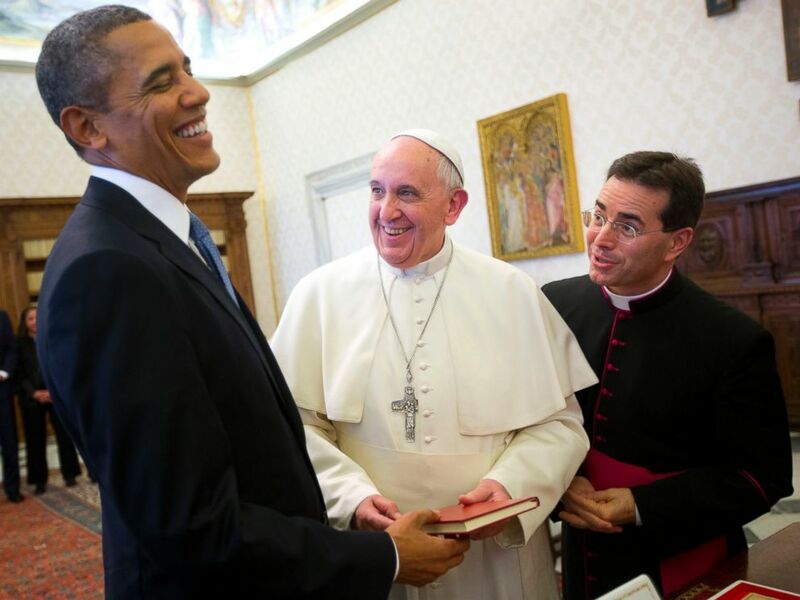 In this Thursday, March 27, 2014 file photo, U.S. President Barack Obama, left, reacts as he meets with Pope Francis, center, during their exchange of gifts at the Vatican. 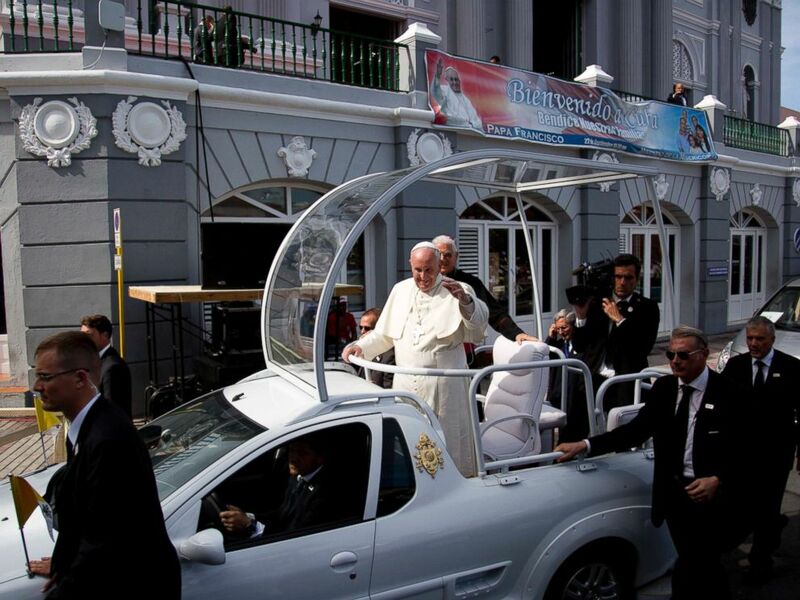 The famous “Popemobile,” which allows Popes to elevate above crowds, isn’t always the same car. There are several different vehicles that make up a larger papal vehicle fleet. A modified Jeep Wrangler will serve as his Popemobile American ride. The Popemobile bares the custom license plate “SCV 1,” the initials for Status Civitatis Vaticanae, Latin for Vatican City State. Even before his papal inauguration in March 2013, Pope Francis was known for being different from the papal pack that preceded him. One key difference that will be on full display during his time in the U.S.: For the most part, he insists on ditching the bullet-proof-glass bubble so he can be closer to the public -- and won’t be guarded by one while riding in the Jeep during his U.S. stay. A staple protection tradition of the Popemobile’s past, the feature was added to the Popemobile after the attempted assassination of Pope John Paul II in 1981. Vatican Radio reported that despite potential dangers, the Pope doesn’t care for the bulletproof glass, describing it as a “sardine can” and arguing that it doesn’t allow him to engage with the crowd. PHOTO:Pope Francis carries his work bag in Rome's Fiumicino International airport, July 5, 2015, as he boards his flight to Quito, Ecuador. "It's true that anything could happen, but let's face it, at my age I don't have much to lose," he said, according to Vatican Radio. While Pope Francis is not in his Popemobile, he’ll be transported in a closed car. Richard Kane, the president and CEO of International Limousine Service, will be providing transportation for His Holiness and his entourage in all three cities, according to Washington Business Journal. Upon his arrival at the Joint Andrews Base in Maryland, Pope Francis was transported in a Fiat. The plane that Pope Francis travels on is sometimes referred to as “Shepherd One,” a play off of the U.S. president’s aircraft, Air Force One. However, “Shepherd One” is just a nickname for the papal plane, which does not include the fancy features that the U.S. commander-in-chief has aboard his official plane. What’s more, the plane does not even belong to the Pope; it’s a commercial jet reserved for him from the Italian airline Alitalia. Everything on board the plane is, however, marked with the papal coat of arms. Security surrounds Pope Francis' popemobile as he makes his way to the Metropolitan Cathedral to celebrate Mass in Santiago de Cuba, Cuba, Sept. 22, 2015. The Pope traveled on an Alitalia flight to D.C., but will ride U.S. jet carrier American Airlines Boeing 777-200 for the remainder of his trip. Everything on board the plane is marked with the papal coat of arms. The 76 accredited journalists from all over the world that make up the Vatican Accredited Media Personnel, or the “VAMP,” will be documenting Pope Francis’ trip to the America. Among the VAMP members traveling with the pope this trip is ABC News’ Terry Moran. 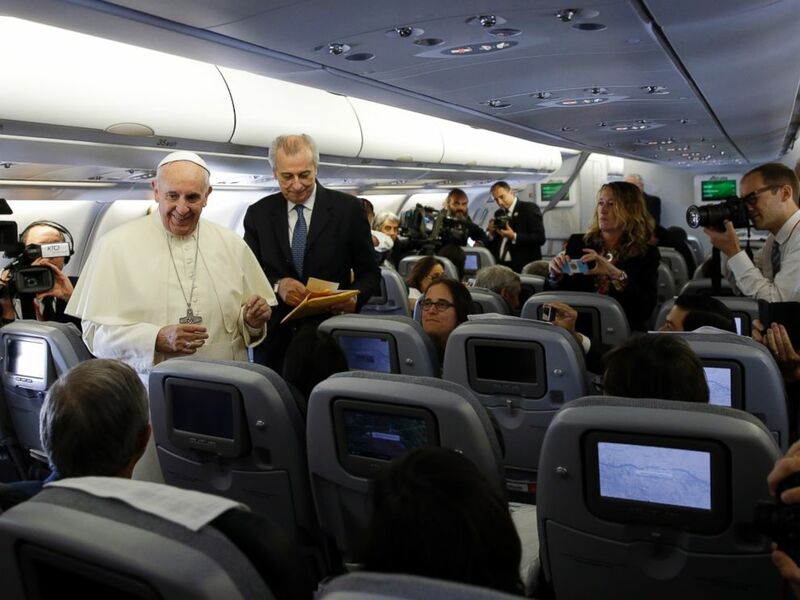 Once everyone is boarded, Pope Francis walks from his seat in the front cabin to the back of the plane to speak with the reporters and enjoys greeting each journalist on-board individually. One fun old-school papal trip vestige: It’s a Vatican tradition for the pope to send a telegram as he flies over the country. ABC News’ Tom Thornton contributed to this production.